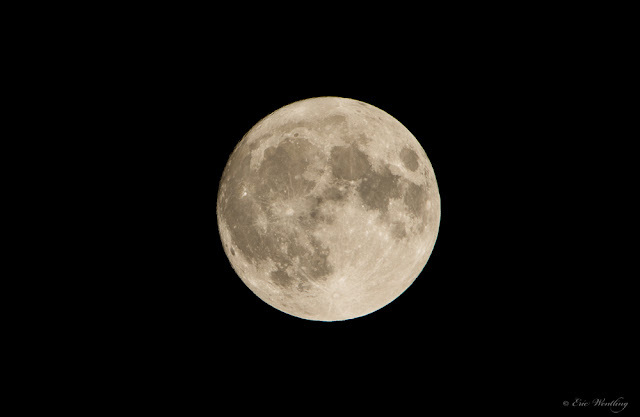 Moon photo by my talented husband, Eric Wentling. This month, Lindsay Starr chose Moon for the Art Elements Theme of the Month. I was initially worried that I wouldn't have anything suitable since I used a bunch of moon themed things over the last couple of years. I shouldn't have worried... I did have a few appropriate things squirreled away! The problem ending up being finding the time to make things. January got busier than I had been planning for! My moon-themed art beads... fine pewter by Green Girl, mixed media resin pendant and ceramics by Gaea, and lampwork by unknown artist. I had honestly forgotten that the pendant by Green Girl Studios I had set aside with some coordinating beads had a moon in the design... I think that I had originally pulled it for the crow. I figured that this was a good time to revisit the partially thought out design since it fit with the theme and helped me resolve one more UFO from my oh-so-messy workspace. Win-win!! 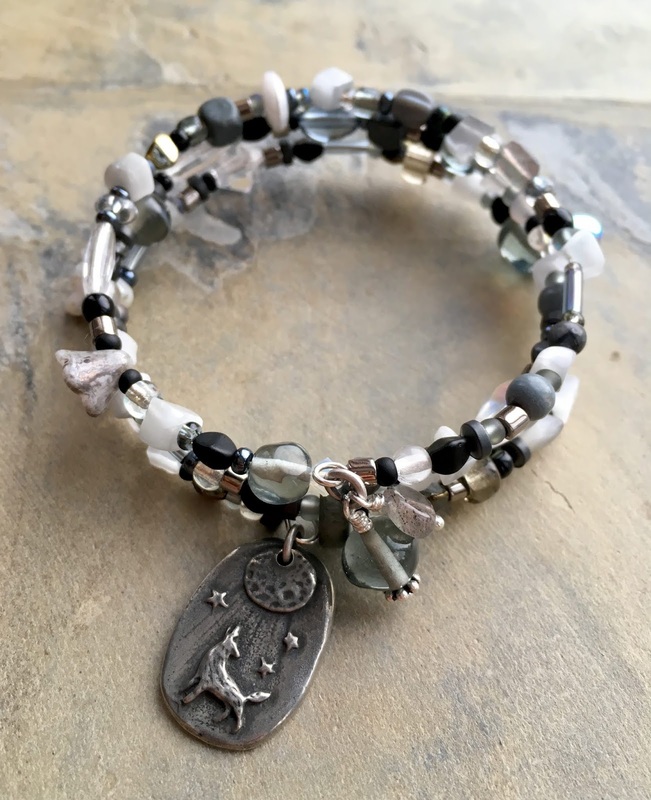 Some of the beads that I ended up using were in my original collection of beads for this pendant, some were plucked from an Allegory Gallery bead blend, and some from a gift of Swarovski lovelies from Brenda Schweder from the Adornments Retreat. I decided to go with an asymmetrical design strung on one side, links and chain on the other. I kept it all to a palette of black, greys, silvers, and a tiny bit of white... colors of the moon and moonlight as well as the night sky in which it hangs. I thought I'd share this one too. It wasn't made for this challenge specifically, but for yesterday's Inspired by Reading Book Club. I had some fun with riveting. I made the moon shape with some textured copper scrap left over from the Christmas ornaments I made last year and used some little spacers underneath to give it some dimensionality. If you're curious about my full book club post, you can read it HERE. As you can see, I didn't get around to some of the more colorful moon options that I had pulled out. Tomorrow's another day! This is a blog hop... please check out what the other participants have been inspired to make this month! I really like the riveted moon you have created for the Book Club project that is most definitely my favourite piece! 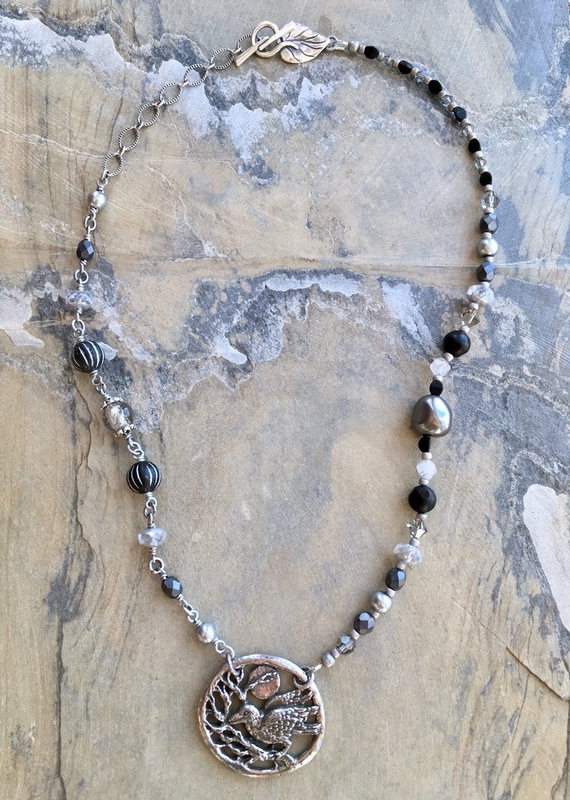 I love the asymmetrical design design of the necklace - I am not good at asymmetrical designs and I love seeing how other people use it for their jewelry. I also love the riveting you did for the last pendant. All the pieces are gorgeous! All of the pieces are beautiful! The last one is probably my favorite for the wonderful contrast. Love your combination of components, colors and textures! Hope you get to use the other moon components sometime too - you've got a wonderful collection. You really DID have some things to work with! Great pieces - love the necklace! And your own riveted piece - I had seen your preview - it's great! I have to use up some of my GGS stash so I can justify my shopping spree come B&B!! 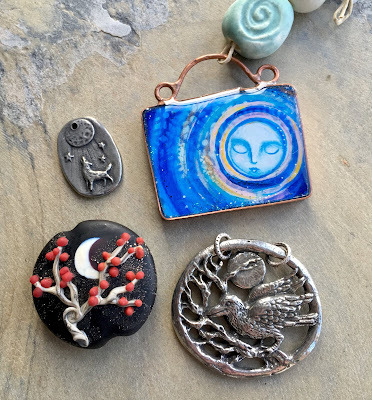 You always have so many beautiful artisan pendant options! And, your use of them never disappoints! The simple, neutral, starry palettes you chose really let the pendants shine. Awesome job. 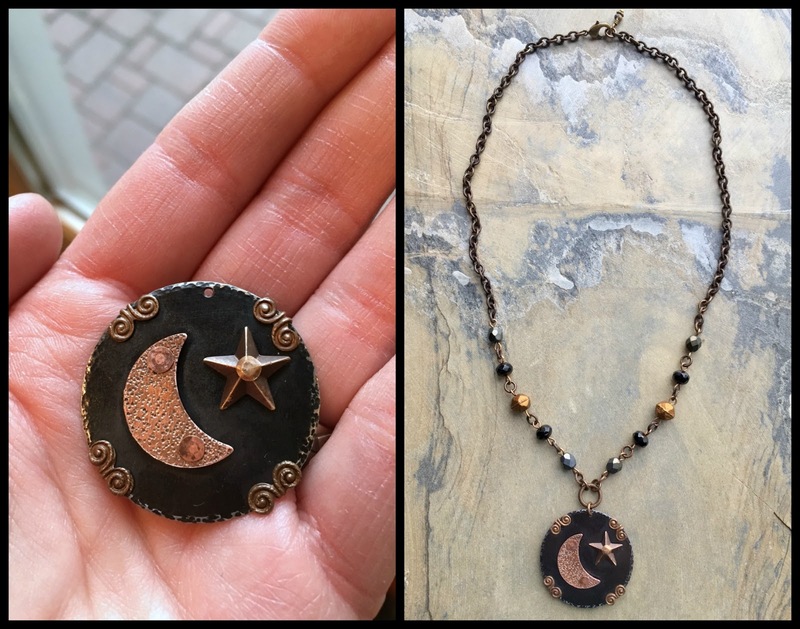 Love the necklaces and bracelet, but I really love how you created the riveted moon and star piece. Just fabulous work. All of your jewelry and components are great. You have a great collection of beads! Fabulous components and wonderful designs, I bet you have an amazing bead stash! First: I would so love to have a look through your stash! You always show such beauties! All lovely pieces but I really LOVE the first necklace the balance is just perfect! Gosh! I love everything, but that first necklace is my favorite! The balance and colors are perfection. And I'm personally a huge fan of crows and ravens. And I loved getting a sneak peek for the book club piece too. Fantastic work and thanks for reading AE and participating in our challenges. And once again, congrats on the ABS contributor position! Your first necklace makes me smile. I love your eclectic mix of beads! And of course the riveted one, I had seen that on instagram I think ... or your blog. I had 3 or 4 other previously made projects I was going to include in my post, but didnt. That'll be a separate post. Love, love, love! The color palettes are perfect for the focals and that riveted pendant is superb. Ooh, it looks like you had fun this month! I have the same Green Girl pendant but in bronze...but until I saw your necklace it never occurred to me there was a moon behind the crow! You've inspired me to go digging in my boxes for beads to go with it now. Isn't it nice how our stashes always answer a challenge with exactly what you need...and then some? Thank you for playing along with us! I hope to see your creations again next month too! That riveted piece of yours is my personal favorite! I love the color choices of all your pieces, they are perfect for a starry night! I love that book group and our theme coordinated! And was inspirational. You make lovely work! Your pieces are a slam-dunk for this month's inspiration! You never fail to amaze and delight with how creatively you interpret the challenges. I love the palette and feel of the necklace and bracelet so much. Great work! All so pretty, love the monochromatic colors you used for the raven necklace.